A little healthy not-super-competitive competition never hurt anyone. Unless you're Nolan and you take the game to heart. Lucky to have found a bunch of misfits who would rather dive around in sand than play a contact sport with real rules. Chance to dust off those long-lost/probably-never-there volley skills. Two things remain true - I'm still short, and nothing feels better than a well-executed float serve. Whatever you do, just don't make me laugh. Many courts and combinations of peeps later, I'd say pick up balleyball games needs to remain on my hobbies list. Madison introduced me to squash curries. I wasn't impressed with Ha Long Bay the first time I went. Everyone I knew loved it (and then I found out it was even featured by Zimmern). But my standard of measure when it's on the menu is Panang curry, and it was so licorice heavy that I had a headache at the end of dinner. 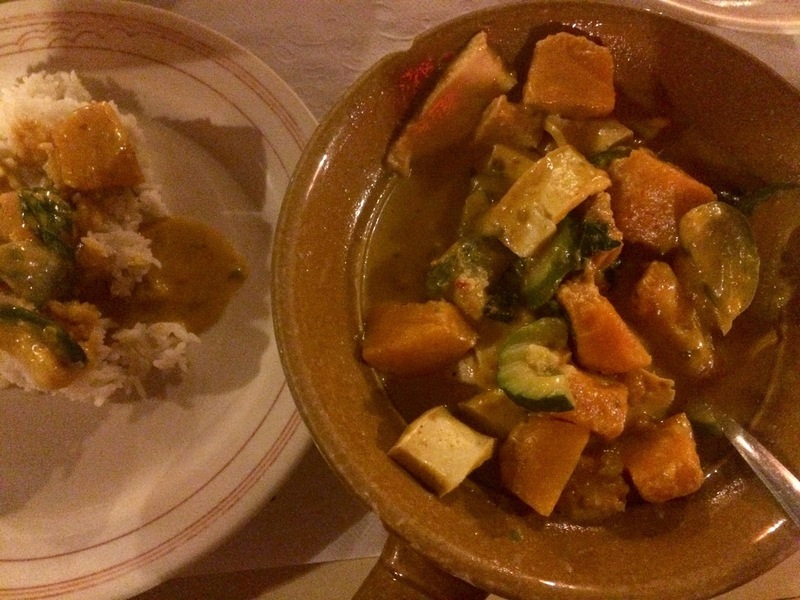 I did return once again with Leslie for massaman curry which did not overwhelm me. So in the end, everyone I knew was mostly right. At Lao Laan Xang, I finally tried this squash curry that everyone speaks of... that's not true, I've had it at potlucks from a Thai place.. so I finally sat down at a restaurant and tried this squash curry that everyone speaks of. It was good. How I expect a curry to be. It wasn't super memorable. Probably because my memory of this Laotian place is overshadowed by one of my first impressions of Bianca. Within weeks of meeting her, her roommate had taken her to this Laotian place, and it was 1/2 of what she talked about when food was brought up. Jules and I already knew it had to be good. At Monsoon Siam I decided tofu balls are the best curry vehicles. They're these crispy (there's that delicious word again) tofu and potato conglomeratses. With squash. 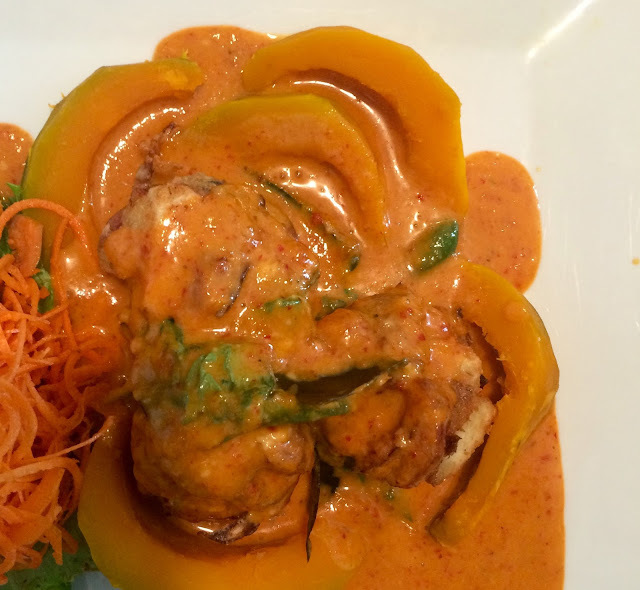 Drenched in a creamy and intense curry. 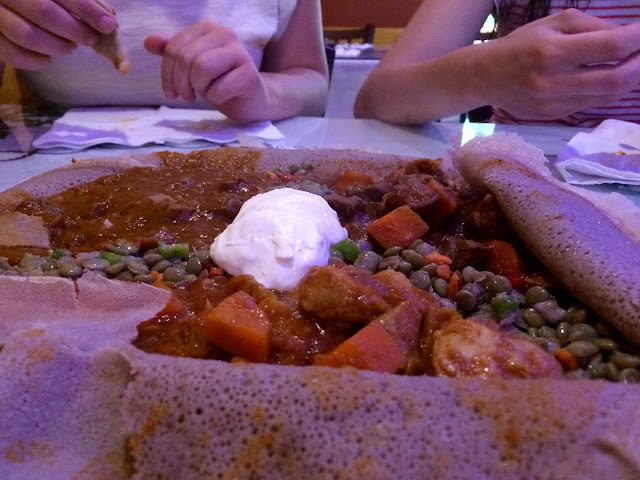 Ethiopian food is curry-like right? Or stew-like. Buraka family style with a lamb, a beef, and a chicken just to cover all our bases. And delicious vinagery lentils. But let's be real, the reason I'm here is for the spongey, acidic injera. My heart will always belong to that place in Melbourne though. Tip: just order your own plate... family style did not mean more food. You don't need to do it "for the experience."